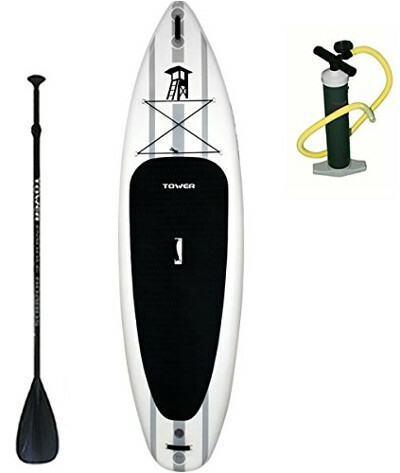 Tower Paddle Boards is a brand with a large line of inflatable standup paddle boards that range from those that measure 9 feet long to 14 feet. This brand is dedicated to creating iSUPs that are the nearest possible to authentic boards. 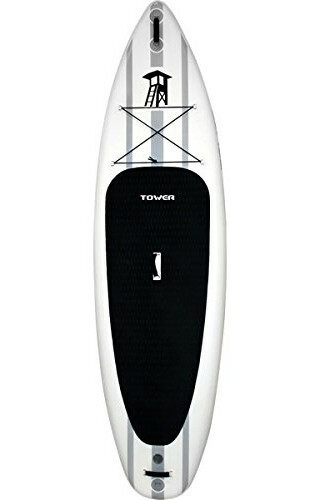 Tower iSUPs are made with a set goal in mind; making stand up paddle boarding a sport that is “part surfing, part exploration, and most importantly, part phenomenal core body workout.” It’s a friendly water sport that gained a huge popularity in the recent years for all the practicality and functionality it offers. In this review, however, we’ll have a closer look at only one iSUP as an example for what’s mentioned above. The Adventure 2 is an inflatable board that got some of the best ratings for all what it is, and since you’re here, let’s go through what you need to know about it. The Adventurer 2 is easy to store. When rolled up, It's 1 foot in diameter and 33" wide. Now this board is definitely not small in size. The Adventure 2 is 10.4 feet long which can take both small and large riders. This exact measurement is great for different activities from recreational paddling to touring or working out. I said working out with Yoga in mind actually; this board is 32 inches wide which I’d say rare for boards in the range of 10 feet length. Those 32 inches will make sure you’re completely stable in any position you take. This board feels very wide compared to other iSUPs that barely reach 30 inches for wideness. As for thickness, I’m excited to tell you that the Adventurer 2 was ran over by a car and that got nothing on it. The 6 inches thickness make the board very stiff to keep you floating above water even it reaches its weight capacity. It’s here where things get serious. The Tower as a brand is known for going extreme when it comes for how rugged are the materials chosen to construct their iSUPs. The Adventurer 2 is made with drop-stitch technology that uses thousands of fibers to connect the top deck to the bottom to hold its shape and extend its life time. The military grade PVC material is also so strong it’s used to build Zodiac boats, river rafts, and bullet proof vests. Unless something really sharp happened to strongly stab this board, it’ll last to tell about all the adventures you’ve taken it through. Thus, being a friendly user is highly recommended. This board comes with a nice black EVA traction pad that is so comfortable and thick adding to the stiffness of the board as a whole. A rear kick-tail for better control and functionality making the board a total badass. You’ll find 3 rigid carry handles to make carrying the inflated board an easy task with a little hand. There are also 5 D-rings on the Adventurer 2; 4 of which are on the board’s front and are connected with a bungee cord, while the last one is for safety leash attachment on the tail. The total of fins is 3; one is central and removal, the other two are smaller, fixed and lateral. Those fins make sure the board tracks in a straight line in different water conditions. The previously mentioned removable fin. A 3 piece fiberglass paddle that’s really light yet durable. And high pressure hand pump that you can take with you anywhere you go. It’s a petty that such a strong board does not with its own carry backpack which would’ve saved you a lot of trouble. What we appreciated most about the Adventurer 2 is its versatility; it performed beautifully and professionally in both flat and white waters. Its sharp nose allow it to make its way through the water easily and swiftly with minimum effort, while the stiffness of its body and the trio-fin navigation system add significantly to the speed factor. This board is so stable and steady anyone can easily move on top of it, perform some maneuvers, or even play Yoga. I wouldn’t be exaggerating when I say that the Adventurer 2 is one of the most stable iSUPs out there. All in all; riding this tough guy was a pleasure that reflected how much thought and effort was put into making it; and with a 2 years warranty, the Tower are proving to stand behind their handcraft. 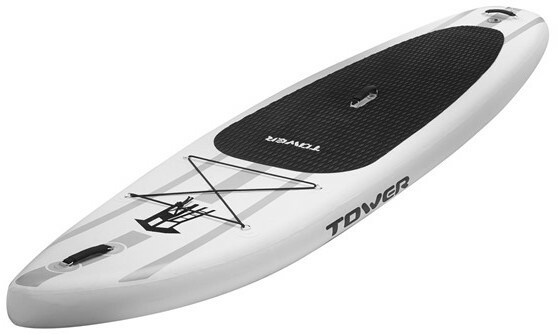 The Tower Adventurer 2 is one of the best inflatable stand up paddle board out there. It’s quite stable and it performs really well on various water conditions. The best thing about the Adventure 2 is its 32 inches width; it makes the board very stable and balanced even when weight capacity is reached. It’s so tough and rigged that a car could run over it leaving no damage. The rear kick-pad is a great add for better control and performance. It can take over all different water conditions thanks to its strong body and sleek design. The Adventurer 2 comes in a very simple package that lacks a backpack and a repair it. You might not need this latter, but you’ll need to buy a separate backpack bag for the board.